A “female relative” (anonymous, of course) has “come forward” in a manner of speaking to accuse George Zimmerman of having “molested her” from the time she was 6 and he was 8. It’s another one of those “I was afraid to say anything” (until she could get some publicity by doing it when Zimmerman was already in trouble, that is) deals. Just more efforts on the part of the state and the judge to assure a conviction of Zimmerman whenever his trial begins. Watch this space for more bulletins, as warranted. George Zimmerman was released from custody again today (July 6) — this time on $1 million bond. This is until the judge and the state find another excuse to claim that he somehow “violated the terms of his bond” or “was planning to flee,” or some such excuse. They will keep kowtowing to the race baiters in Florida, as soon as they can figure out a way to do so. Watch this space for further updates! The judge today (July 5) raised George Zimmerman’s bond to $1 million, claiming that Zimmerman was “preparing to flee” (of course His Honor didn’t bother to explain that remark.) None of the news media seem to have thought to check whether the bond is cash, or any kind (10 percent through a bondsman). I still say Zimmerman is being railroaded. Watch for further bulletins on this website! George Zimmerman’s attorney today (June 21) released police video tapes which show Zimmerman relating to police how his confrontation with Trayvon Martin led to Martin’s death. The tapes seem to bolster Zimmerman’s claim that he acted because he feared for his life. Will the judge’s revocation of Zimmerman’s bond nine days ago because he and his wife allegedly conspired to hide assets from the court, over-balance the taped evidence when and if there is a trial? Keep watching this space to find out! Today, June 12, the judge ordered the arrest of George Zimmerman’s wife on charges of perjury in connection with her testimony about the family’s financial situation. The attempt to put a judicial thumb on the scales to try to ensure a conviction of Zimmerman continues — do these people think they’re fooling anyone? The judge and prosecutor knew a website had been set up to assist Zimmerman’s defense expenses; when the prosecutor brought this up at Zimmerman’s initial hearing, the judge pretty much brushed it off. Yet another example of what I believe is the state’s and the court’s cooperating in trying to railroad George Zimmerman. More bulletins to come — no doubt. The judge in the Zimmerman case ordered George Zimmerman’s bond revoked today because he allegedly misrepresented his financial circumstances and failed to surrender a second passport. Wonder if this is just an excuse to throw him back into jail, in the general population, in hopes that some black “Trayvon supporter” will attack or even kill him? Is anyone surprised at this turn of events? I’m certainly not. Watch for more bulletins as the case develops. Four of the witnesses to the Zimmerman-Martin incident who gave statements to the police the night that Martin was killed have now “changed” their stories, the news media reported Wednesday, May 23. Can you say, “Someone got to them?” But these witnesses’ “faulty memories” may make it even harder than it would have been before to convict George Zimmerman of anything. I’ll keep you readers posted as I learn more; I see that more than 2,000 of you have read this story now. New information released over the May 17-19 period by the state shows that Zimmerman did indeed have cuts on the back of his head, a broken nose, and two black eyes just after his confrontation with Martin. Much of commentator opinion now appears to be that Zimmerman “will walk.” And that it probably will result in black riots. Stay tuned! Reuters news agency has produced another excellent investigative report about the Zimmerman-Martin case, published on the American Renaissance website today (April 25). See the link to American Renaissance on the Corporal’s Corner home page to read it. The British news agency Reuters reported today (April 16) that neighbors of George Zimmerman said he had bandages on the back of his head and across his nose the day after his shooting of Trayvon Martin. This appears to confirm his statement to the police that Martin broke his nose with a punch, then banged his head against the pavement, before Zimmerman fired the fatal shot. The special prosecutor in the Trayvon Martin case announced this evening that she has filed charges of second-degree murder against George Zimmerman for defending himself from a strong-arm attack by the teenager. So much for Florida’s “Stand Your Ground” law. Apparently the power of the mob, and of Revs Al and Jesse, trump everything else when a craven system is desperately trying to avoid the riots they were afraid would occur had the prosecutor concluded that Mr. Zimmerman did, in fact, have a right to defend himself. She also announced that Zimmerman had already “turned himself in,” and is “in custody.” Apparently he has a lot more faith in the Florida judicial system than is warranted under the circumstances. Check this site; I may have more follow-ups on this story as it develops. Have they lynched George Zimmerman yet? I mean, literally. They’ve strung him up figuratively a thousand times over during the past two or three weeks. In case you’ve been vacationing in Antarctica during that time and were thus out of touch with the mainstream media, Zimmerman is the 28-year-old mixed-race man who shot and killed black, 17-year-old Trayvon Martin outside a gated community in Sanford, Florida, last month, allegedly after Zimmerman, a neighborhood watch member, saw Martin lurking about, wearing his hoodie, and suspected that he was up to no good. Zimmerman says Martin decked him with a punch, then banged his head against the concrete, and that Zimmerman then fired one shot from the pistol he had tucked in his waistband, hitting Martin in the chest and killing him. The mainstream media, on the other hand, have labored mightly to construct a case for Zimmerman having killed Martin in cold blood because of — wait for it: — “White racism.” After all, Zimmerman’s father is White, even though his mother is from Peru and of mostly Indian descent. So he must be “White” — right? Zimmerman told police who investigated the shooting that he had stopped following Martin on the night in question after a 911 police operator told him on his cell phone that police didn’t “need you to do that.” He says he was going back to his car when Martin suddenly jumped out in front of him, made threatening statements, then slugged him, knocking him down. He told investigating officers that it was while Martin was banging Zimmerman’s head against the pavement that the latter pulled out his gun, fearing his life was in danger, and shot Martin. The police report gives Zimmerman’s version of what happened, and notes that he had blood on the side of his head, welts or cuts on the back of his head, and grass stains on the back of his jacket indicating that he had been lying on his back on the ground. Presumably he hadn’t stretched out for forty winks while he was doing his neighborhood watch patrol. As a result, police did not file charges against Zimmerman, apparently concluding that the killing was done in self-defense. Florida has a “stand your ground” law that allows people to use deadly force without fleeing an attacker, if they fear their life is in danger. Martin’s parents were, understandably enough, outraged. I probably would have been, too, if he were my son. But then the racial grievances industry got wind of the incident, and so did the mainstream media. Both went completely “ape”, so to speak, over it. The two chief professional U.S. race baiters, Revs. Al and Jesse, have howled and threatened before mobs — excuse me, gatherings — of “outraged” blacks (funny how everybody’s “outraged” about something nowadays, isn’t it?) in Sanford, in New York City, and probably elsewhere. After all, when you’re a full-time fisher in troubled waters, you go where they’re bitin’ the best. For the last several weeks, that’s been Sanford. The Black Caucus in Congress, not noted for its decorum in the best of times, in the last two weeks seemed to take turns posturing and pontificating for the cameras on the issue of the villainy of George Zimmerman and on how this proves that “racism is alive and well in America.” Congressman Bobby Rush, a former Black Panther from Chicago, even donned a hoodie similar to that worn by Martin on the night of his death, to take the podium in the House, resulting in his being admonished for breaking House rules, and escorted from the chamber by the sergeant-at-arms. “Gorilla theater,” you might call it. 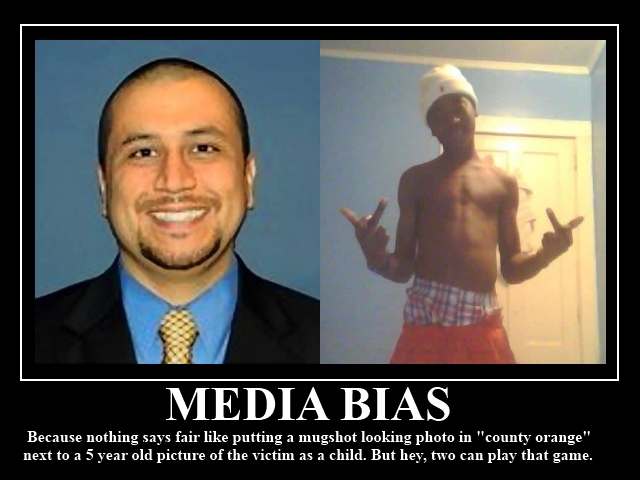 The media, sensing a big story and an opportunity to stick their thumb in Whitey’s eye as they did with Rodney King, Tawana Brawley, and others, have blown up the incident as a second Emmett Till case — a ridiculous comparison — and have all but branded Zimmerman a cold-blooded murderer. They have published five-year-old photos of Trayvon Martin showing him as an angelic 12-year-old (as a 17-year-old he was six feet tall, weighed 160 pounds, and played high school football). They have ignored his three suspensions from school — one for possession of a quantity of jewelry of suspicious origin, another for having marijuana residue in his backpack. Can you say, “Drug seller”? Check the photos of Martin and Zimmerman on this page to see more up-to-date views of both than we saw on the news. As a result, there have been marches, angry demonstrations, demands for Zimmerman’s arrest (he has gone into hiding, as there have been death threats, and a “bounty” of $10,000 has been put on his head by the New Black Panther Party.) A special prosecutor has been appointed to examine all the evidence and either (a) file some charge or charges against Zimmerman; (b) find that there is not enough evidence for a charge; or (c) present the case to a grand jury. Does anyone think that Zimmerman will really be judged on the evidence, after all this hue and cry? Do any Americans believe that the special prosecutor will not feel irresistible pressure to file charges, justified or not? Or that a grand jury, presented the case, would not feel practically obligated to return a true bill against George Zimmerman, regardless where the evidence and the prosecutor led them? The mainstream American media should be deeply ashamed of themselves for the way they have indulged in shameless rabble rousing in this case. If there are no charges filed, even if the evidence is crystal clear that none are justified, it is highly likely that there will be urban riots among blacks in Florida, and possibly elsewhere. People could be killed; there could be huge destruction of property. The scab on America’s wound of race will have been deliberately picked off, yet again. As we all know now, King was black. And we haven’t. The media ballyhooed and trumpeted the story until hell wouldn’t have them. And the result? Massive riots in Los Angeles, 58 people killed, over a billion dollars in damage. Do the print and broadcast moguls want a repeat of that? Makes you wonder, doesn’t it? If you want to read something about what all this beating of the drum of racial grievance has done so far, go to www.amren.com and read the story posted April 4, from a city in Ohio, about a 78-year-old White man who was beaten up by six young black savages, supposedly in “retaliation” for Martin’s death. You think this will make the national news? Don’t hold your breath until it does. Here’s an update that just came out today, April 9: George Zimmerman has opened his own website, www.therealgeorgezimmerman.com , to try to help raise funds for any defense he may require if he is arrested in connection with Martin’s death. The new website was periodically off-line on its first day; if you’re interested in helping Zimmerman, be patient and keep trying to access it. I’m going to. ← Obama: “The Brother”? Or, “The Other”? Another great column, Old Corporal. Thanks for being the someone who ferrets out the ENTIRE story! Yes, it seems the press is actively TRYING to start riots YET AGAIN! How sad. Thanks for telling the whole truth. Thanks, old corporal for enlightening us. Seems like this poor fellow is going to be lynched in reality before very long. I cannot imagine anywhere in the U.S. where he might get a FAIR trial? WHY he even NEEDS to be put on trial is the real question. I hope you can help garner some support for the poor fellow. It could have been any of us, trying to protect ourselves, couldn’t it?